The Year of the Horse is certainly off to the races (ba dum dum…couldn’t help myself). My husband and I both started new jobs in early Spring and have been running around like crazy people. Also, I’ve gone off the deep end with my yoga practice so I’ve been spending quite a bit of time in the yoga studio. So much, in fact, that I’ve decided to take yoga teacher training this fall! Stay tuned for more on that, if you’re interested. However, even with all of this, it’s not as if I haven’t been cooking. I have. But not as much. Happy to report that I’m starting to get back into the rhythm of things, I think. 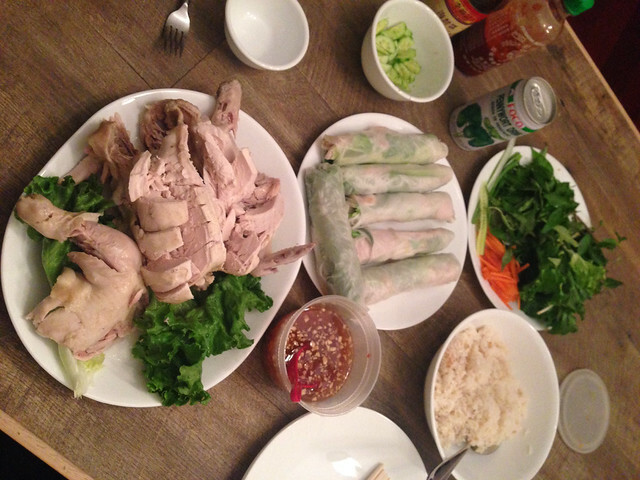 One of my favorite new meals came from the Ravenous Couple Com Ga Hai Nam (Hainan Chicken and Rice). Really refreshing and flavorful at the same time. The cooking method for the rice was interesting – you use the fragrant broth after poaching the chicken with other spices and aromatics tossed in right in the rice cooker! 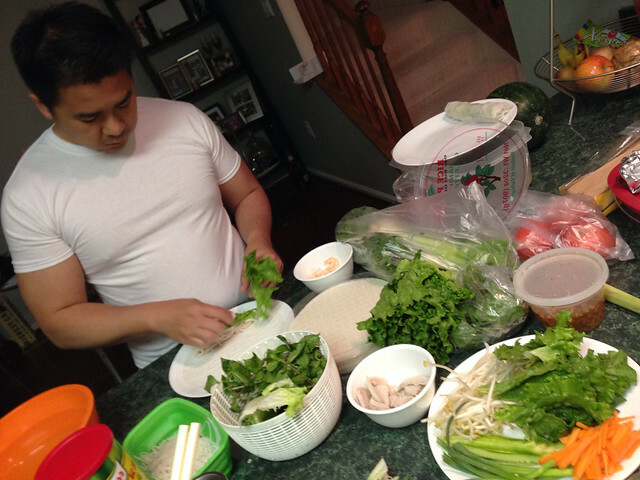 Anh even helped roll some of the Goi Cuon. With enough nuoc mam gung left over, I made Gỏi Ngó Sen Tôm Thịt (Lotus Root Salad with Shrimp and Pork) and Canh Bi (Fuzzy Melon Soup) for dinner later in the week. I was pleasantly surprised how easy the salad is to prepare – really refreshing for a hot late-spring evening. Without the pork ear/cartilage, I’ll be sure to make this for my own family as well! Boil the shrimp in water with 1 tbs sugar and 1 tbs fish sauce until opaque pink. Remove from water and set aside in covered bowl to cool. In the same water, add the pork and cook through – approximately 10-15 minutes depending on thickness. Remove from water and cool in plastic covered bowl. While all that’s happening, prepare the lotus root. Drain them from the brine solution and rinse well. Slice on the diagonal so they are still long, but not as thick. One jar may not seem like a lot initially, but once you slice and toss with remaining ingredients you’ll have plenty. Rough chop the fresh herbs and toss with the lotus roots and shredded carrot. Once cool, halve the shrimp, and cut the pork into thin slices. 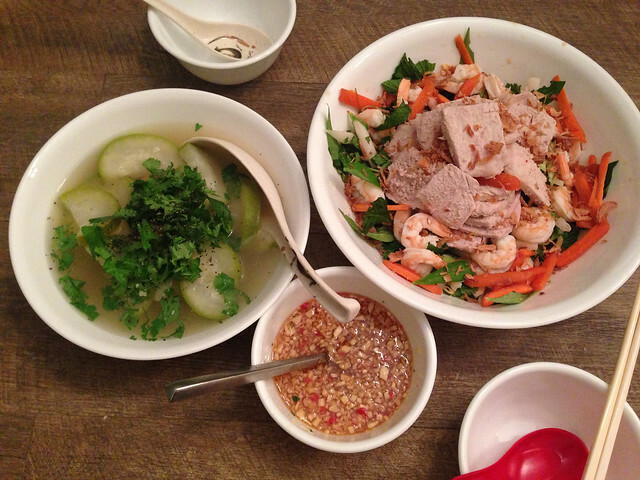 Arrange on top of the mixed salad and top with crisp fried shallots, drizzle with nuoc mam gung.